Shandong Leader Machinery Co.,ltd. integrates R&D, design, manufacture, sales and import & export of machinery into one. We always supply food machinery oil pressing Machine and auxiliary machine For Oil Press and security equipment Multifunctional sprial juicer machine with ce certificate with high quality & high performance, also with competitive price. Our company is located in the ShanDong Province, which is the center of business and economy city. In the concept of "Tolerance & Reputation, People-oriented & Innovation-driven, Technology & Service", we communicate, research and cooperate with universities, research institutes, engineering companies in various industries and system integrators in food machine industry and security industry. With many cooperative factories, we can provide a wide range of products in order to cater for your special orders. 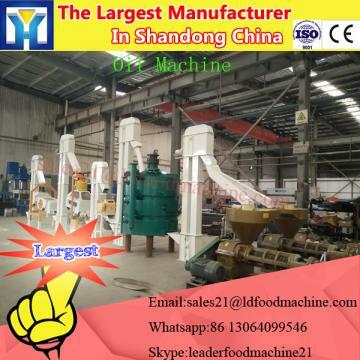 Works is broken after the pulp, juice, leather through the hopper into the spiral juicer, due to the screw diameter along the bottom slag is expected to export direction gradually increase and pitch gradually reduce, when the material being spiral propulsion for spiral cavity volume shrinking, form for material crushing.Screw spindle rotation direction from the feed hopper to slag trough direction, as the clockwise direction.Raw material add to the feed hopper, under the propulsion of spiral compression, the squeezing the juice through a filter at the bottom of the gravy, while the waste and the conical part of the surge tank by screw formed between the annular gap discharge, pressure regulating head along the axial movement of adjustable gap size.From the slag trough of equipment used in clockwise (to the feed hopper depending on the rotation handwheel bearing seat, regulating the head to the left, the gap is narrowing, conversely gap bigger. )Change the size gap, changing the resistance of slag discharge, can change the rate of slag, but if the gap is too small, the strong pressure, part of slag particles with juice by filter out, although the juice increased, but the quality of juice relative decline, the size of the gap should be depending on the user's specific technical requirements.To achieve the goal of juice and automatic separation of slag. This machine is suitable for crushing pineapples, apples, pears, coconut and so on after crushing the benevolence fruits juice. 1, the machine must be installed level, and the ground screw fixation. 2, when the equipment is started, should adjust head make the annular gap, gap decreases, after meet the process requirements, with a fixed wheel brake bearing seat position. 3 and feed must be uniform, absolutely rigid foreign body into the hopper, so as not to damage the screen. 5, after each shift job must wash with water and brush filter.If the juice of the fiber is more fine filtration, must according to the condition of production, increase a wash between net, when pressing after all cleaning machine with hot water. 1.delivery time: 30 days after receiving the whole payment. 2.Payment term: 100% paid by T/T in advance. Quality guarantee term is for one year . Malfunctions which are caused by machine-self and quality will be responsible for our manufacturer. Other malfunctions which are caused by operation mistakes, man-made problems, etc will be responsible for clients-self. Zhengzhou Gashili Machinery CO.LTD, built in 1998, It is a research, design, manufacturing as a whole, the long-term commitment to all kinds of agriculture machines and food machines and equipment and so on. Our company now has more than 150 employees and gathered a wide range of junior and senior engineers. Honest and trustworthy is our service motto. We have established good and stable cooperation with domestic and foreign customers including manufacturers, importers, trading companies and wholesalers from more than 50 countries and areas. We wholeheartedly welcome customers from both at home and abroad to visit us to discuss cooperation and seek common development. We believe our company is your most reliable partner and friend. Shandong Leader Machinery Co.,ltd. is a professional supplier of the different kind of machinery oil pressing Machine and auxiliary machine For Oil Press. Our products Multifunctional sprial juicer machine with ce certificate has been exported to all over the world, Especially to Europe, North and South America, Africa, East and South Asia, Australia, New Zealand, etc.Through our joint efforts, oil pressing Machine and auxiliary machine For Oil Press have gained good reputation from our clients in communication, products quality, delivery, after-service, and other aspects.Shandong Leader Machinery Co.,ltd. are looking forward to establishing a long-term and mutual-benefit business relationship with all of you. We will assure you our competitive price with better quality and service. We believe you will get what you expect from our company by oil pressing Machine and auxiliary machine For Oil Press.We accept different method for payment of Multifunctional sprial juicer machine with ce certificate, just like TT, LC, Escrow. You just need to choose one which is conveninet and safe for you.